In 2006, Jacob and I took our second trip to volunteer in a Chinese orphanage. We met lots of precious kids, but one in particular that stood out to us was a little 8-year-old boy we nicknamed "Daniel." I shared his story a long, long time ago on our blog... but there's more to the story than what I previously shared, and it has all come to a beautiful end today. In the year after we left the orphanage, we never really forgot about Daniel. He was always in the back of our minds. 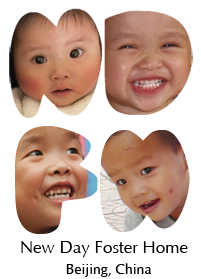 I am part of the Waiting Children China yahoo group -- a huge group of adoptive parents/supporters who network and support each other through the Special Needs adoption process. To be honest, I never open the emails. There are just too many of them!! I usually just delete. The only reason I don't cancel my subscription to it is because I lost the yahoo password that the account is under, and I haven't spent the time to try to figure out how to deactivate without a password. It's easier to just hit delete. I e-mailed the agency with the file, introduced myself, and by giving her some of Daniel's identifying information, asked if the little boy they had happened to be the same child we'd met. She wrote back immediately and said he was. My excitement was short-lived, however... for she proceeded to tell me that she'd had his file for about 6 months, and they were going to have to send it back within a matter of weeks if they didn't find a match for him. And, since they'd already had his file so long, it didn't seem promising that he'd get another chance at getting his file sent to another agency. Which meant his chances for getting matched with a family were nearing zero. I could tell the caseworker had done all she could to find this little guy a family, but she sounded as if she was about to give up... he was older, and for most adoptive families, that seems like a lost cause. All she had to use in advocating for him were a few grainy pictures and a medical file. Nothing about who he really was. I quickly offered to write something up about our experience with him... something that could help people get to know the little boy behind the pictures and the medical file. I asked if I could post it on the Waiting Child China yahoo group. She gave me her blessing, and within a couple of hours, I'd sent out his story to thousands of inboxes. It didn't take long for the interest to start pouring in... within just a few days of hearing his story, there were several families interested i him. His mom said this in her email, "He had a photo album with about six or seven pictures - two of them were of you. We told him through the guide that you are the one who told us about him. I think he understands this. I believe that through you Our Heavenly Father has brought us together as a family. I will never be able to thank you enough. Isn't it wonderful how God weaves our lives together." To know that he's kept our pictures these 3 years -- without knowing that we hadn't forgotten him -- touches something deep inside of me. Something beyond description. He never gave up hope. And God used a lot of "random circumstances" to bring us into a relationship with little Sammy at his orphanage, with his adoption agency when they were having trouble placing him, and with his adoptive family now that he's going home. His mom is right, of course. It is wonderful how God weaves our lives together. Sammy, I'm so glad you are going home! I know it won't be easy to get used to a new country, a new family, and a new language at the age of 10, but I believe you have the strength, courage, and love to do it with a lot of grace. God has clearly had His hand on your life for many years... He never forgot you. And what He has started, He will bring to completion, even as you are learning what it means to be a part of a family. We love you, and we never forgot you. Jacob and I feel so honored to have met you and to have had the opportunity to be a small part of your story. oh my goodness! I remember that email...I remember forwarding that email on! Ok, so I'm crying like a baby! It always amazes me how God works things out! What an awesome story! It is amazing to see how God moves through you and Jacob. I know it must be so hard at times to be so far away from "home" but God has a definate calling on your life. It's always such a gift when you're given a glimps into how He uses you for His glory:-). Very touching story. wow...lots and lots of tears. What a beautiful story!!! Our God is SO big and His love for these children is SO grand. Beautiful, just beautiful!! I just visited their blog and told them that I remembered your stories about him and have kept him in my heart all these years. Sometimes, we don't find out the answers to our prayers. Thank you so much for sharing this wonderful answer. God's grace abounds. Okay... so... this one made me cry.